Hi! 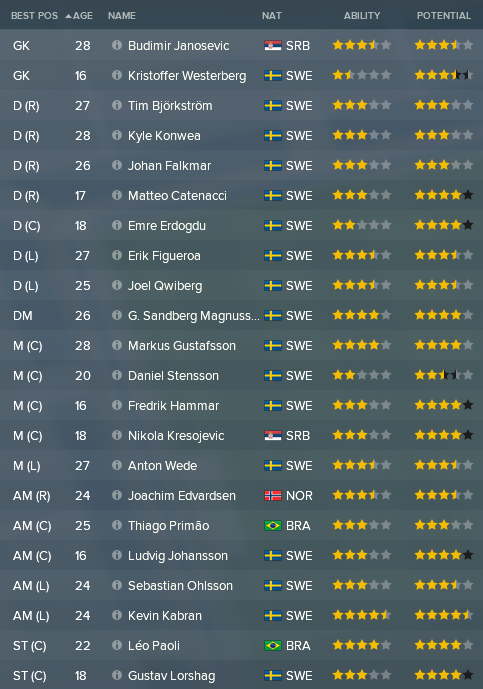 MikaelinhoFM here with the fourth episode of my first ever FM18 blog “The Bromma Boys” about Swedish talent factory Brommapojkarna. 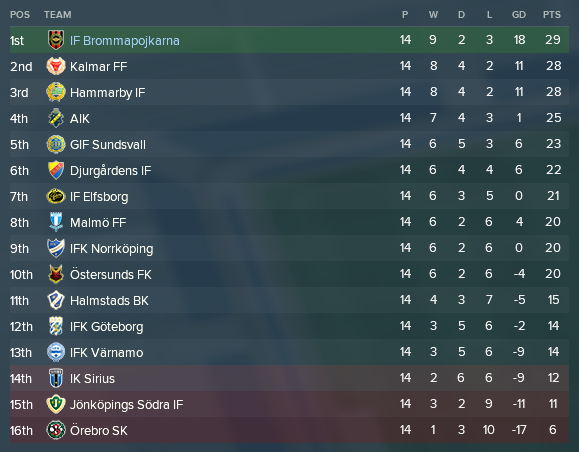 In the two earlier episodes (#1 and #2) you have been introduced to the club Brommapojkarna and my short and long-term ambitions with the club. Being Sweden’s talent factory no 1 we intend to build a squad worthy of European glory with Academy players. 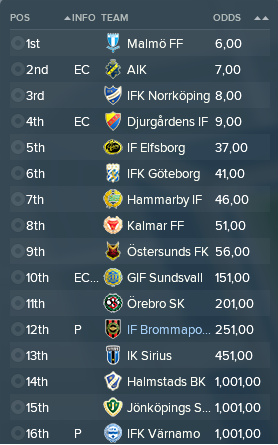 After a couple of tough years we’ve just been promoted back to the 2nd tier Superettan when the save starts. In this episode we will look at transfers in and out, pre-season and the first half of the 2018 season. We will also check in on our Academy stars to see how they have developed since last year. Despite being in the red financially we got around €100K transfer budget to spend. As per last season we had to rely mostly on free transfers. Since my ambition is to develop our youth players I have to let them play in order to achieve that. Therefore I was a bit picky regarding what players to bring in. The rest of the budget was spent on right-footed winger Sebastian Ohlsson from IFK Göteborg. Since we play with an inside forward to the left and a more traditional winger to the right, we can use him on both flanks. In my opinion he has all the right abilities to compete for a place in the starting eleven on either side. A real bargain I reckon! Tim Björkström is a former BP Academy and first team player. A versatile defender with lots of experience, which could come in handy when surrounded by inexperienced youngsters! Finally, the Brazilian signing of the season. Not exceptional in any way, but decent enough to play in our AMC position. What stands out is his determination. He will be used extensively as a tutor to bring up the determination of our younger players, something that is much needed. The deal in which young star Gyökeres left for Brighton was agreed before the save started. It’s always negative to lose your star player, but I was happy to pretty much get back to break even financially with the money from the deal. Unfortunately no money rolled into my account when Gyökeres left (bug?) so we stay well over €1M in the red going into the new season. Also agreed upon was the departure of our best young central defender Starfelt on a free transfer to sleeping giants IFK Göteborg. Our right winger Brandeborn, seeking a new adventure, also decided to leave on a free transfer. Well, as mentioned above, things are looking grim financially. Even though the forthcoming season holds three well-attended derbies we still have to sell players in order to get us up to positive figures. Our biggest nightmare is a downgrade of our Academy, something I’ll try to avoid at almost any cost. From being quite worried at the end of 2017 with only 13 players in the squad, I feel quite confident with the squad going into the 2018 season. We have decent coverage in every position and a couple of players that stand out. I think we look solid in both defence and offence. I decided to promote many of our 5-star prospects, providing the squad with some depth and at the same time giving them the chance to develop in a first-team environment. Some of them are pretty close to playing, while others are far away, but I think that they’ll all benefit from this experience in the long run. Kevin Kabran has really turned in to a proper superstar at this level! He spent most of last seasons’ first half coming in as a central forward off the bench. Since shifting to the 4-2-3-1 he started nearly every game as an inside forward starting out on the left. With 11 goals and 7 assists in the 2017 season he was one of our most important players and a big reason for our promotion. Not that spectacular on paper, but decent acceleration, pace and off the ball means that he often puts himself in position to create chances, for himself and others. My only concern is that he is very close to reaching his potential, but hopefully he’ll be able to do a good job in Allsvenskan. 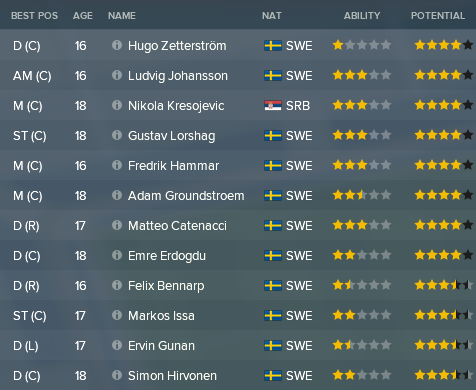 With eight players with 5-star potential and another four with 4.5-star potential, I must say that I feel satisfied with the current state of the Academy. Some of the players are showing such current ability that they might be fighting for a place in the starting eleven during the 2018 season. Below, I will take an in-depth look at the development of the players we highlighted as potential stars in our introduction episode as well as our new potential stars. Result: No, he might not get his chance sooner or later. At least not at BP. Sold to Lille for €425K in a deal that could bring in more money in the future if he turns into a good player. Result: Sold to Wolves for €375K in a deal accepted by the board. Decent money for a decent player. Result: Made one appearance in our cup game. Spent the rest of the year playing for the U19/U21. He also made 3 appearances for the Serbian U21s. Development: An extraordinary development over the year. +1 or +2 increases in almost every ability. +3 increases in Determination, Positioning, Acceleration and strength! New prediction: He will be joining the first team squad and will certainly be in contention for either of the central midfield roles this season, so no need to change the prediction. Result: Spent the season on loan at 3rd tier team Husqvarna, scoring 10 times in 25 games. Development: Very nice indeed. +1 or +2 increases in almost every ability. +3 increases in First touch, Decisions, Vision and balance. New prediction: He will be joining the first team squad and will primarily serve as a back-up to Brazilian star Leo Paoli. Hopefully he’ll get some games here and there and keep developing. No need to change the prediction. Result: No first team games last season but managed an impressive 7.71 avg rating in 37 games for the U19/U21 teams. Played for the Swedish U19s. Development: Starting the season with a Light-hearted personality and a Determination of 2, we didn’t have high hopes considering his development over the year. He improved most skills by +1, but managed to increase some physical attributes by +2 or +3. However, the tutoring during the season paid off, resulting in a +7 increase in Determination and a personality change to Fairly Loyal. New prediction: He is still quite far away from becoming a starter, but he will be promoted to the first team squad on a “watch-and-learn” basis. Hopefully his improved Determination will mean a more rapid development in the 2018 season. Result: No first team games last season, and only 8 games from start for the U19/U21 teams. Development: Not the development we were after. Most abilities unchanged, a few +1s and a single +2 increase to Strength. New prediction: He will remain in the U19s and will most likely not be offered a professional contract at the end of the year. Result: Promoted to the first team squad in 2017 because of a lack of wing backs and money he made 7 appearances from start and 8 off the bench with a decent 6.90 avg rating. He managed 2 assists and 1 MoM in these games. Played for the Swedish U19s. Development: Decent development. Mostly +1s, but nice +2 increases to Decisions, Dribbling, Positioning, Pace, Stamina and Strength. A well-needed +4 increase to Determination. New prediction: He will remain in the first team squad basically on the same premises as last year. He will start the occasional game but will need to improve significantly to become a long-lasting player. 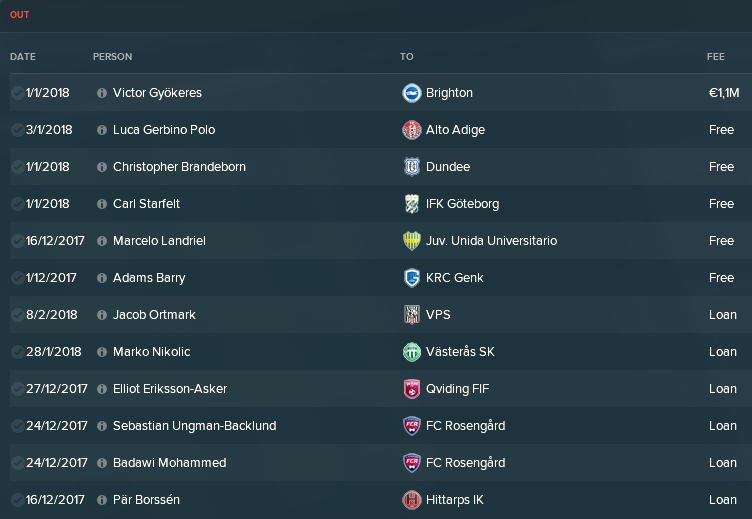 Result: Played 8 games on loan at 3rd tier club Umeå and played 50(!) games for the U19/U21 teams with an avg rating of 7.41. Development: Possibly the least improved player of the bunch. Most abilities unchanged, a few +1s and a single +3 increase to Strength. New prediction: Will be promoted to the senior squad, hoping this will tremendously boost his development. If it doesn’t, he’ll most likely be out the door at the end of the season. Oh my god! Well. I mean. Oh my god! Ludvig Johansson, at the age of 16, looks destined to play as our AMC for many years to come! Played 5 games from start in the 2017 season. Of course he’ll need to improve in every aspect of the game, but he certainly has the potential and the ability to make it big! Prediction: I have high hopes of him becoming a club legend and a Swedish international. Well, at least he has a 5-star potential. And decent defensive skills. And a decent determination. Awful in the physical department though. Prediction: Will need multiple seasons in order to possibly become a first-team player. Not at all the same amount of pre-season games as last year, since this season we’re qualified for the upcoming group stage of the Swedish Cup. I tried to schedule as many games as possible to at least reach a decent tactical familiarity with our new 4-2-3-1. We started off with back-to-back 7-0 wins against lower league sides to get the pre-season started. We then carried on emphatically beating premier division sides from Denmark, Finland, France and Sweden. Things are certainly looking great going into the group stage of the cup! A fully rotated squad gave us the right start with an easy 3-1 win against 4th tier Linköping City. We continued our winning ways with two impressive wins away to Allsvenskan sides Örebro and Sirius. Kevin Kabran and new signing Edvardsen were outstanding, scoring and assisting like crazy! The three victories of course meant that we won Group 2, which resulted in us playing one of the other group winners in a single game quarter-final. The draw saw us face Swedish giants Malmö FF at home. Malmö tried to buy the home advantage for €77K with potential for more since teams split the ticket revenues. We chose to decline, reasoning that a home game would give us a significantly larger chance to advance to the semi-final. Unfortunately, both Kabran and Edvardsen got injured in our final game of the group stage, which meant that we would have to do without our hottest duo. The game played out quite evenly, with us being the slightly better team. 0-0 after full time meant that the game went to overtime. In the 122nd minute, we came so close to claiming the victory when a header hit the crossbar. Unfortunately, it didn’t go in. Tired and nervous we went into a penalty shootout where we lost 2-3. Disappointing with a loss, but very satisfying to see us manage to go neck to neck with the best Swedish team in recent years. The media seems impressed with our 2017 season, but not to the extent that they believe us to do more than just stay out of the relegation battle. Our board are expecting a midtable finish, but considering we crushed teams predicted to end up in positions near us and we almost beat Malmö FF, media predicted winners, I want to aim a lot higher. This might seem foolish or cocky or whatever, but I’m aiming for European qualification straight away! This means that we have to finish third or better. A high aim for a newcomer, but based on our pre-season and cup run I don’t think it’s impossible. Unsurprisingly considering our lack of star players, no BP player makes it into the Media Dream Team. Malmö top the list with 3 players. Right before the start of Allsvenskan, on the last day of the transfer window Malmö FF came in with a €900K bid for Kabran, which I managed to negotiate up to €1.8M plus 30% of the next sale. Whether to accept this or not was a really hard decision to make. On the one hand, it would clear all our debts, on the other hand Kabran had been our best player by far! My initial thought was to reject it, thinking of our newly forged ambitions for European qualification. The amount of money up front finally made me accept the bid though, with a tear in the corner of my eye. However, Malmö didn’t manage to get the paperwork sorted in time so the deal fell through. Considering how happy this made me, I was probably saved from my own wrong decision. We played 14 games before the summer break for the World Cup. As you can see above most of the times we’ve been good, really good. The highlight so far is the 4 game streak winning 3-1 or 4-1 against some pretty good teams. We’ve also been quite underwhelming at a couple of occasions. Nothing much to say about the loss against Hammarby. Playing at Tele2 Arena instead of our usual home ground Grimsta, I think most of the players were a bit overwhelmed by the atmosphere created by 30000+ (mostly Hammarby) fans. The other two losses though, were both undeserving and unnecessary. Without them our first half of the season would have been outstanding, now I’ll have to call it “just great”. Even though our aims were set high before the season, I didn’t expect us to be top of the league halfway through. There is only one point separating the top three teams and nine points down to tenth place. I actually think all of these top ten teams still have the chance of winning Allsvenskan. We start off the autumn part of the season with a very important game, at home to Malmö. I think the second part of the season will be a bit tougher with three away derbys. Hopefully we can keep our good form and end up in the top three! In the next episode we will look at the rest of the 2018 season. Will we stay top of the league for a sensational first season Allsvenskan title or will our lack of experience result in numerous losses during the autumn? Will our bad financial status force us to sell our star players or close down our beloved Academy? The only way to find out is by reading the next episode! 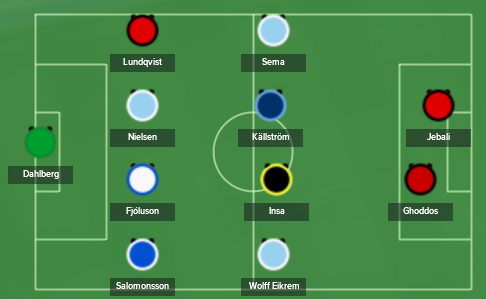 This entry was posted in FM18 Stories, Football Manager 2018, The Bromma Boys | @MikaelinhoFM and tagged brommapojkarna, fm stories, fm18, football manager, sweden, swedish allsvenskan, swedish cup. Bookmark the permalink.